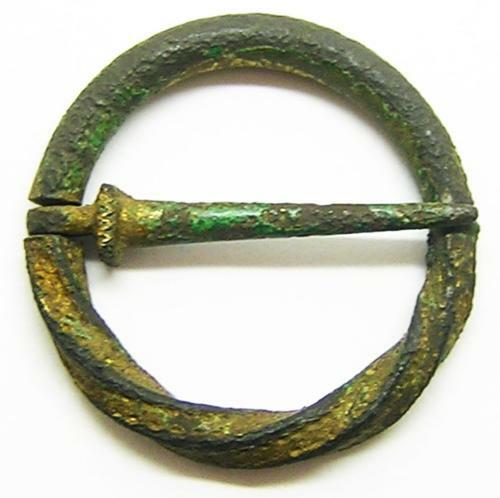 This is a complete medieval ring-brooch, dating to the 13th - 14th century AD. Ring-brooches are the most common type medieval brooch to survive and had a practical function: to fasten tunics, especially at the neck. Shaped as rings, with a long central pin, these brooches varied enormously in size and could be tiny, smaller than a fingernail. Ring-brooches were made of costly gold or silver, or of much cheaper copper or pewter. They were worn mostly until the late fourteenth century when changing fashions in dress included more closely tailored clothes and the growing use of button fastenings. This example is decorated with a circular cross-section frame, smooth surfaces around one half and 'cable twist' design around the other half. Close parallel recorded from Cambridgeshire CAM-36E4FB . The pin is original, intact and in perfect working condition. Such a brooch would have once secured woolen fabrics. A nice example with traces of the original gilding giving a more expensive gold appearance. PROVENANCE: Ex. metal detector find from Chesterfield, Derbyshire.